I’ve been staring into my crystal ball and trying to foresee what 2015 holds. I keep staring and staring but I can’t seem to see anything. A good clean job might do the job…ehm…nothing. I don’t think this is working. If you know me, then you know the above scenario and a crystal ball would be the last thing I’d be staring at. I think sometimes, we want people to predict our future and lay it on a plate for us. The sad reality is that (like the saying goes) if it’s to be, then it’s up to me. With that in mind, I’ve been thinking of what I want to achieve in the coming year, especially with regards to my role as a children’s book author. I would like to write four books next year. Below are the David Chuka titles hopefully coming to your book shelf sometime in 2015. Such a vivid and colorful tale for such a simple, yet important lesson; listen to your parents. The illustrations are vibrant and imaginative as are the characters. Kojo the Sea Dragon Gets Lost is a very fun read! In this episode, Kojo and his friends plus everyone in the Zakari River is looking forward to the BOOM BOOM festival. It’s a time of fun, dancing, singing with lots of food. Everyone in the Zakari River gathers in the town center and there are performances by different groups. Kojo is looking forward to doing a special dance with his friends. The day finally arrives and Kojo is having so much fun with his friends and is enjoying the sights and sounds. Then something happens with some yummy cake and an evil eel that makes Kojo learn something new about his world and talking to strangers. This will most likely be the first book I publish in the coming year, so watch this space. Non-Fiction Book on Writing and Publishing Children’s Books – I get asked a lot of questions by people looking to write and publish children’s books and I think it’s time I crystallise all my experience into a book that get that can help other aspiring and established children’s book authors. Some of the topics I’ll be touching in this book will include working with an illustrator, doing research, getting reviews, social media, marketing etc. I’m excited about the challenge of writing this book and currently putting ideas together. 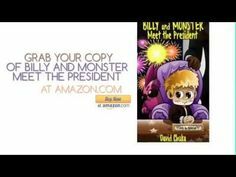 Billy and Monster Meet the President – Like my most recent book – Billy and Monster’s Golden Christmas – I had finished writing this book in 2013 but due to challenges in finding the right illustrator, its release was delayed. I am quietly confident that I’ll be able to get this published in May and just in time for the Independence Day celebrations. A Book about Thanksgiving – I’m not really sure what the story or characters will be but I do know that it’ll something based around Thanksgiving. I could either place Billy or Kojo in a situation where they learn something valuable about Thanksgiving. On the other hand, I could create new characters and tell the Thanksgiving story through them. Will provide more details later. I’ll be visiting more schools in 2015 and looking to share my stories with more of my target audience. Thanks for all your support and do have a Merry Christmas and a Prosperous 2015. Wow! What a line up! I’m looking forward to all of your new books, but after having so much fun reading about Billy & Monster at Christmas, I’m especially looking forward to what you come up with for Thanksgiving. Thanks for stopping by today Stephanie. 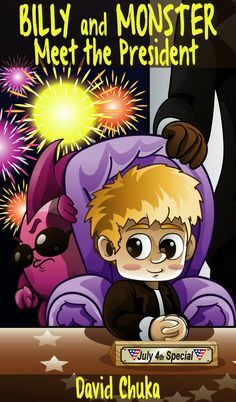 I’m especially (at the moment) looking forward to ‘Billy and Monster Meet the President,’ as its a funny story that touches on some tough issues in our world today like terrorism, interacting with strangers and integrity. Also looking forward to seeing what adventures Wally gets up to in 2015.